Don’t invest too much in this plant’s name. Ponytail palm (Beaucarnea recurvata) is neither a real palm nor does it really have ponytails. Its swollen base looks like a palm and the long, thin leaves curve outward, then hang down like ponytails. But does ponytail palm flower? If you are hoping for flowers and fruit from this plant, there is good news and bad news. While you can get flowering on a ponytail palm, you may have to wait up to 30 years to see it. 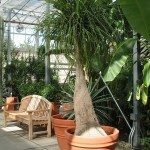 You can grow ponytail palm in the ground or in very large pots. In either case, given sufficient patience, you may be lucky enough to see it flower. Flowering on a ponytail palm does not occur the first year you purchase a small plant, nor, likely during the next decade. 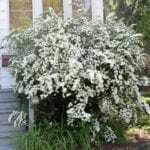 Before the plant flowers, it increases significantly in size and girth. The plant’s palm-like trunk sometimes grows to 18 feet high and widens t 6 feet in diameter. But size alone does not trigger first flowering on a ponytail palm. 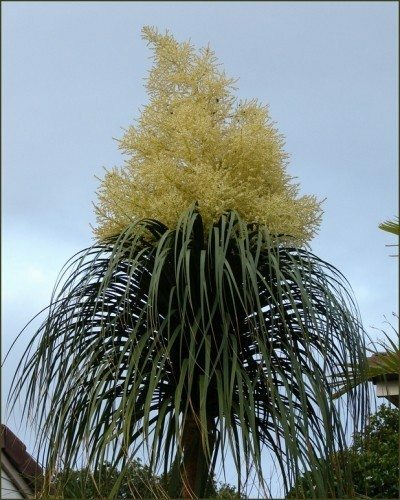 Experts believe that a combination of factors, including weather, can be instrumental in causing initial ponytail palm flowering. Once the plant blooms, it will flower every summer. You will know that ponytail palm flowering is near when the ponytail palm flower spike appears. The spike looks like a feather plume and it will produce myriad small branches holding hundreds of tiny flowers. The ponytail palm is dioecious. This means that it produces male flowers on some plants and female flowers on others. You can tell whether your flowering ponytail plants are male or female by the flower colors. Females have pink flowers; male flowers are ivory. Bees and other insects flock to the blooms. If your flowering ponytail plants are female, they may bear fruit after flowering. However, they will only do so if there are male flowering ponytail plants nearby. 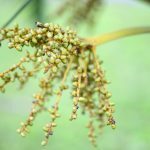 The seed capsules on the ponytail palm flower spike are papery capsules. They contain tan seeds the size and shape of peppercorns. Once flowering and fruiting is completed, each ponytail palm flower spike dries up and withers. 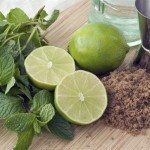 Cut it off at this point to enhance the beauty of the plant.